Homeowners Association, the Friends and Neighbors of the Deschutes Canyon Area (FANs), the Oregon Natural Desert Association (ONDA), the Bureau of Land Management (BLM), Crooked River National Grassland/Ochoco National Forest, and the Crooked River Ranch Fire and Rescue, as well as a select group of citizen representatives from Crooked River Ranch who have previously opposed wilderness designation. • Fuels reduction needs on public lands adjacent to CRR and concerns regarding fire management on public lands. • Potential for these issues to be addressed concurrently in a legislative package. The following guiding principles outline the terms under which the working group participants agree to support the attainment of these objectives through a federal legislative package. To facilitate mechanical fuels treatments on Grassland and BLM land within the wildland urban interface, the working group agrees that lands above the canyon rim adjacent to Crooked River Ranch should be released from Wilderness Study Area/Inventoried Roadless Area status. a. Background: The build-up of fuels (mainly young western juniper) on public land adjacent to Crooked River Ranch was identified as a primary concern in discussions of the working group. Although group members acknowledge that private landowners must also do their part by cleaning up their own properties, fuels treatments on most of the BLM land abutting Crooked River Ranch are constrained by the Wilderness Study Area status of these lands. It is possible that BLM could conduct juniper thinning within the WSA to return the area to its natural range of variability, but this action would need to be approved through a lengthy environmental review process under the National Environmental Policy Act (NEPA) and would likely involve only the use of non-mechanized tools, such as crosscut saws. Additionally, BLM could face resistance to fuels treatments within a WSA both internally and from outside groups that could further slow the process. b. Site Visits: In mid-March, 2015, five members of the working group attended a field trip to four locations on public land adjacent to CRR to assess fuels treatment needs above the Deschutes canyon rim. The fuels observed during the site visits were described by BLM fuels specialist Sheldon Rhoden as Phase II juniper woodland with some sites having advanced to early Phase III juniper woodland, where tree density has begun to suppress native understory vegetation. This condition is problematic for fire suppression because higher density of juniper can result in longer flame lengths, torching of trees, and spot fires. Below the canyon rim, juniper growth is sparse. The consensus among those on the field trip was that fuels treatments above the rim should be the priority. 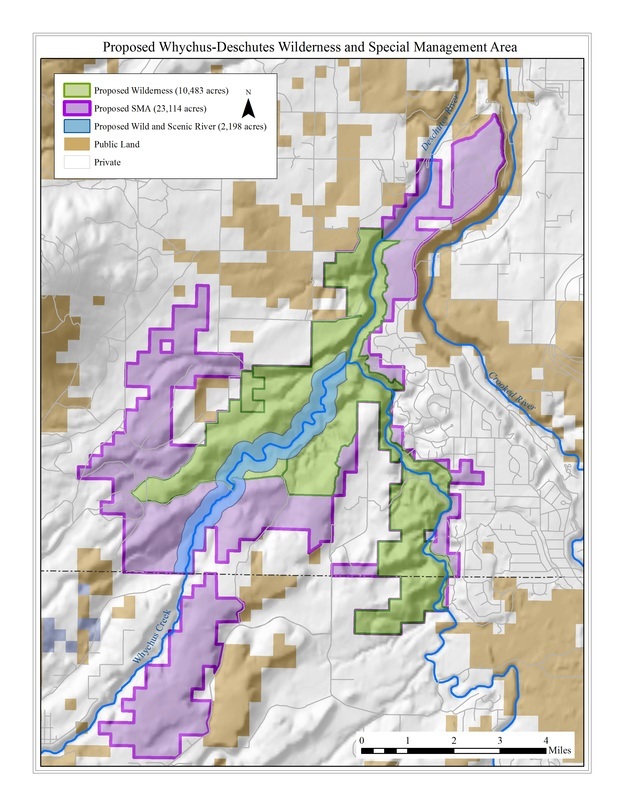 In these sites, the goal would be to return juniper density to Phase I, which BLM estimates would require removal of approximately 50 percent of juniper. a. Release of Wilderness Study Area/Inventoried Roadless Area: Identified public lands currently managed as WSA/IRA above the Deschutes canyon rim (SEE MAP) should be released from WSA/IRA status and should be designated as a special management area to prioritize fire prevention. These lands should be the focus of fuels reduction activities, and mechanical and motorized tools such as chainsaws should be permitted. b. Management of non-wilderness lands: Public lands released from WSA/IRA status and certain other lands within the Whychus-Deschutes area should be designated as a special management area which should have fire prevention and suppression as its primary management focus, with a secondary focus on appropriate and responsible recreation. The special management area should be permanently withdrawn from exploration, leasing and entry for locatable, leasable and saleable minerals, rights of way and other extractive uses. The working group supports a joint local planning effort by the BLM and Crooked River National Grassland which should consider public safety, search and rescue access, fire risk, litter control, wildlife habitat, and impacts to adjacent private landowners in determining appropriate recreation uses within the special management area. c. Wilderness Designation: Legislation should resolve the status of public lands currently managed as the Steelhead Falls/Deschutes Canyon Wilderness Study Area/Inventoried Roadless Area by designating certain portions of those lands as Wilderness. These lands should be managed in accordance with the Wilderness Act of 1964 and other applicable laws. The draft proposed wilderness area boundary is shown on the attached map and is based on existing WSA/IRA boundaries. The final boundary should be determined through further conversations with neighboring private landowners and other stakeholders. d. Special Management Area Fire Management: In the special management area, fires should be fought aggressively to whatever extent necessary to protect human safety, homes and private property. Decisions for the use of motorized and mechanized equipment should be delegated to the Incident Commander of the fire. e. Wilderness Area Fire Management: Fire management actions taken in designated wilderness should be conducted to protect life and safety, to meet natural and cultural resource objectives, and to minimize negative impacts of the fire management actions and of the fires themselves. Working group members understand that within designated wilderness, approval for the emergency use of motorized equipment and mechanical transport, including fire engines, helicopters, chainsaws, pumps and like equipment will remain with the line officer (Forest Supervisor, District Manager, District Ranger or Field Manager). Approval for emergency use of tracked equipment within Forest Service wilderness, such as tractors, bulldozers and excavators, is reserved to the Regional Forester. District Managers or Field Managers may approve tracked vehicles for BLM administered Wilderness. In most cases, the request to use motorized equipment and mechanical transport can be made and granted within the initial response time or shortly thereafter. f. Mutual Aid: The Prineville BLM, Deschutes and Ochoco National Forest, and Crooked River National Grasslands are part of the Central Oregon Fire Management Services (COFMS) organization which utilizes a closest resources approach to firefighting. COFMS cooperates with many non-federal fire services organizations including Crooked River Ranch Fire and Rescue under mutual aid agreements. This means that the closest resources are dispatched to any new fire starts and appropriate resources are provided at no cost for the first 24 hours.